A second phase of formal consultation for the Rail Central development will take place between 15 March and 11.59pm on 23 April 2018. Ashfield Land and Roxhill between them appear more determined than ever to build the largest warehouse park in Europe (this is not an exaggeration) in the middle of four rural villages, changing the character and nature of south Northants forever. Their bland and unsubstantiated assurances that the detrimental effects can be ‘mitigated’ are risible and insulting: you cannot build something of this size without inevitable overspill into the sur rounding communities. If you are not yet angry about this unwanted intrusion into our lives then I would urge you to start getting angry now. None of this is inevitable but if we all do nothing we will get what we deserve. You will get just one chance for your voice to be heard: please do not waste it. 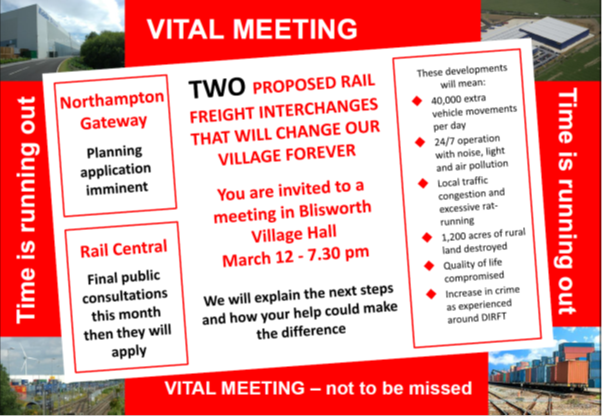 Please attend the (Blisworth) village hall meeting 12th March @ 7.30pm. We’re holding two open evenings at the Northampton Saints’ Rugby Ground, Franklins Gardens on 1 and 8 February. You’ll be invited to learn to sing two songs over an 8-week period with training by our charismatic Musical Director, Stephen Bell. At the end of the 8 weeks you’ll be …ready to perform the songs at our concert in aid of Prostate Cancer UK. It was believed that the proposal for 66 new homes were in the wrong location, not needed and would damage the rural character of Rothersthorpe, according to South Northamptonshire Council’s (SNC) Planning Committee (PC). On Thursday, 4 January 2018 the PC refused permission for an outline planning application from Amanda Jones and Hollins Strategic Land for the new housing estate bordered by Kislingbury Road and Banbury Lane. PC chairman, Cllr Rebecca Breese, said: “South Northamptonshire has stood up to the challenge presented by the national housing shortage and we can show the district will be fulfilling its obligations for more than a decade. “Our local planning policies are clear in that we can only allow house building to take place where there is infrastructure to support it, not only to ensure developments are sustainable, but also to protect the rural character of our villages. The proposals were outside the confines of Rothersthorpe and in the open countryside where development can only take place in exceptional circumstances. SNC can currently show it has sufficient new homes in the planning pipeline to satisfy its housing needs for just over 10 years. The proposal was also contrary to policies within the South Northamptonshire Local Plan and West Northamptonshire Joint Core Strategy which seek to concentrate house building in Brackley and Towcester while protecting the intrinsic character of the countryside and rural areas. In addition the proposal would also have had a harmful impact on The Rothersthorpe Conservation Area. This is to provide the November update to participants in the Rail Central LLG and keep you informed. We continue to progress our technical work and develop further detail on our proposals so that we can carry out Phase Two consultation and then proceed to submission of an application for a Development Consent Order (DCO). Much of the work is now completed or at an advanced stage. As reported in the October update, Highways forms an important part of the overall package of information we are developing and we anticipate moving forward from our discussions with Highways England and Northamptonshire County Council so that all of the relevant information can be assembled for consultation. As you will be aware, we are looking at both the main site and at J15A of the M1 as we bring together the information that will form the Preliminary Environmental Information (PEI) for consultation. We continue to anticipate carrying out Phase Two Consultation in early 2018. Once we have completed the work required to enable us to proceed to Phase Two consultation, we will update the LLG and, in addition, advertise details on the consultation extensively. The Parish Council have recently addressed concerns about the proposed Roxhill Gateway development which is proposed for land around J15 of the M1. These concerns relate to the lack of information and advanced notice of the exhibitions held in October and the information provided at these exhibitions. The Parish Council will keep the village informed when any further information is available. The Parish Council are also concerned about the proposed Ashfield development at J15A and will provide more information when available. The planning application for the Community Space has finally been resubmitted after lots of engagement with SNC. Residents are encouraged to comment on the SNC Planning website here using the planning reference above. 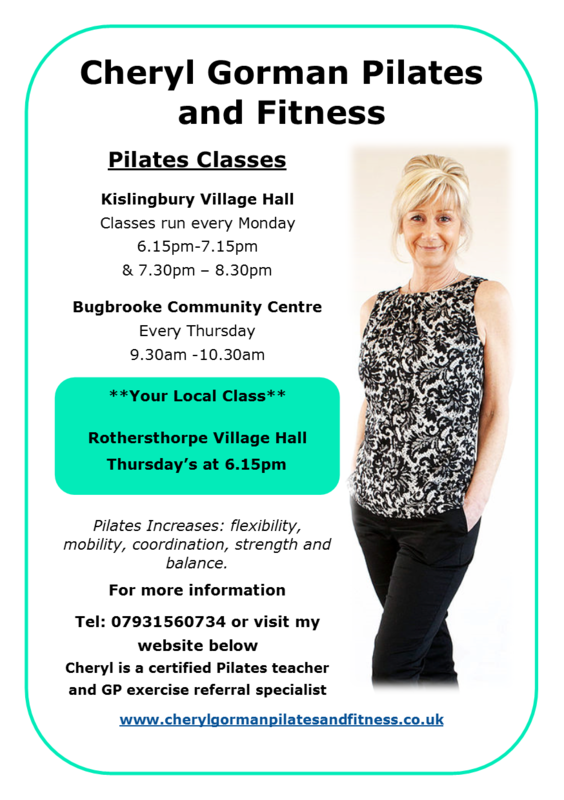 Pilates Classes are continuing in the village hall on Thursday evenings.